Hello! How was your weekend? Do anything exciting? We kept it pretty chill because we thought it was going to rain all weekend, spoiler alert – it did not, but it was cloudy. 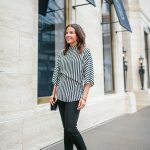 I spent a little bit of the weekend perusing the Nordstrom Half Yearly Sale and shared a few of my favorites HERE. One item I wear tons year round is my blue denim jacket. It’s perfect to pair with dresses, tank tops, camisoles, and tshirts, just to name a few. I have had several days where I really wished I had a white jacket, so I went searching for a lightweight affordable one. It needed to be lightweight since it does get warm down here in Houston. 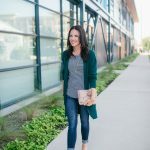 This white denim jacket popped up first in my search and had so many good reviews. I looked over a few more, but I decided to give this one a go. It was one of the more affordable jacket options I found that also had a high reviews. I’m so happy with my purchase too. It’s the perfect lightweight denim for warmer days, but will still keep my warm when people blast the AC indoors. After reading reviews, I sized up to a Medium, and I think it was a good decision. It can be buttoned if needed and still provides a little shape if left open. I’m always cold, so I often bring a jacket or cardigan with me. White is such a great neutral that can easily work with so many outfit combos. 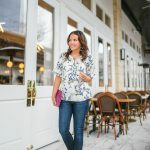 I plan on bringing this jacket along anytime I am wearing my blue jeans, a cute sundress, or just a fun colorful top and black jeans like in today’s outfit post. 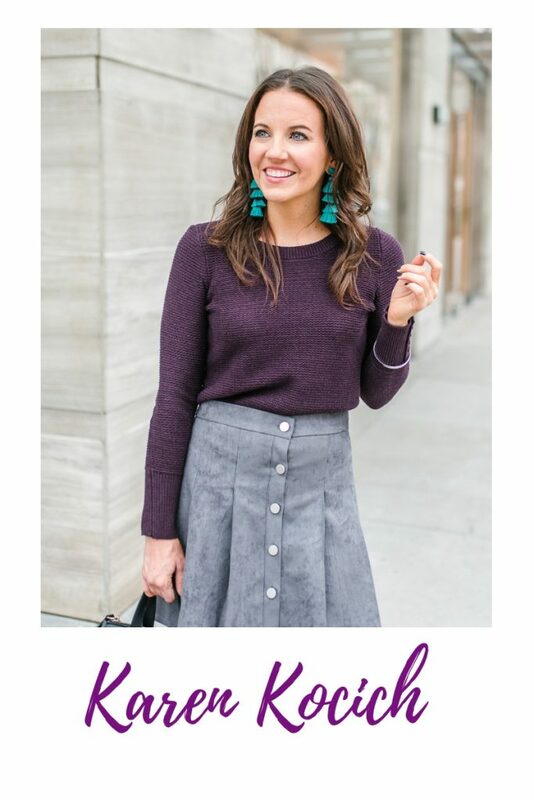 Also, it’s Style File Link Up Day!! Thanks to everyone who joined in the fun last week. I can’t wait to see all of your fabulous outfits this week! Thanks for stopping by ya’ll and don’t forget to check out those Nordstrom Sale picks too. Great classic look, Karen! I love white denim jackets and the fit of this one is perfect. So cool to see you have a linkup – I will have to add it to my lineup. Thanks for linking with Fabulous Friday! Beautiful look Karen! Simple and classic. Love your white denim jacket! Love the easy elegance of your look! The neutral accessories are perfect! Thank you for the link up, hope you’re having a lovely week! A white denim jacket is definitely something I need to purchase! Loving that purse too! I love my denim jacket so much, I think I just might need a white one too! Love it with this coral color for summer. The coral is perfect under the white jacket! Thanks for hosting! love the white denim jacket!! so pretty on you! I need a white denim jacket. Love this! White denim is the best!! I still don’t have a white denim jacket because I always rationalize that I have the vest version. I still might have to get one though–it’s so crisp! I love this outfit, it’s pretty and those black skinnies look great! How adorable is that coral top? Love it with the denim jacket! Love the white denim jacket for a change this summer! It makes any color pop. I adore it contrasted with the coral top. Thanks so much for the link up! That white denim is the perfect layering piece. 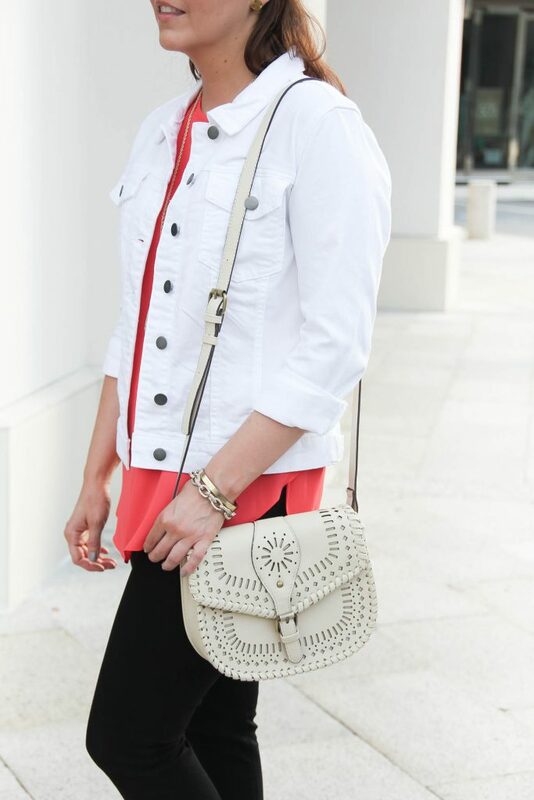 It adds a chic detail to this casual outfit!